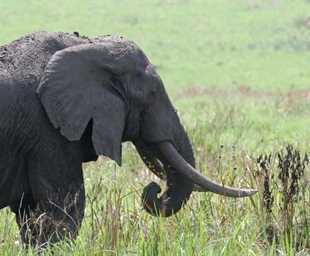 Queen Elizabeth National Park covers an area of about 1,978 km2. 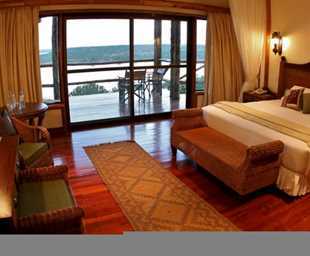 Its position provides a magnificent view of the rift valley floor that occupies Lake Edward and Gorge. The are spectacular views of Mount Rwenzori, the plains and the jagged mass of mountains that are particularly good for hiking. On the other side of Lake Edward, there is a famous hill known as Mitumbe that looks out to Congo. The eastern part of the park is characterised by a lush green escarpment that is acquired from the western rift valley. The features are all covered with savannah making it a beautiful place full of euphorbia trees. The grassland plains support a variety of animals which can be viewed from a vehicle on the network of tracks designated in the park. About 20 predators are found in the park such as lions, leopards, side stripped jackal and spotted hyena among others. There are also various primate species in the park including chimpanzees, red-tailed monkeys, blue monkey, black and white colobus monkey, and olive baboons. The Ishasha sector is famous for its tree-climbing lions and it is also thought to host the world's highest concentration of hippos.